Sprouts Adventure Game Review - Download and Play Free Version! Plenty of goals to shoot for and keep you engaged. Unique plant theme makes this an interesting game. New inventions help you keep your sprouts curious and motivated. The sprouts worship you as their deity and help you earn karma points to aid the sprouts. Keeping the sprouts happy will take up most of your time while playing. The adorable, part-plant, part-animal sprouts have been destroyed by a terrible storm! Only five of them remain to worship their egg-like deity: you. Help them rebuild their beautiful home and raise new sprouts. Enjoy unique spells, fun characters and tons to do! In this simulation game, care for your sprouts by keeping them well-fed, well-rested, curious and motivated. Manage which sprouts eat or play mushroom ball to improve their motivation and curiosity while others build huts, wishing wells and other buildings. 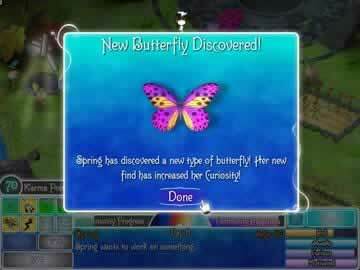 While your sprouts work, search for butterflies, stones and flowers for bonuses to make the sprouts happier. Learn spells like rain to create a garden and spells to hatch baby sprouts. Can you expand the sprout civilization and keep everyone happy? This game is great for both kids and adults because it's easy enough for kids to play but adults can enjoy the challenge of optimizing their sprout workforce. Enjoy hours of fun with your adorable sprouts and replay this game again and again. You'll develop great strategies for caring for all of your sprouts while still building their civilization and you'll have a great time doing so! If you like cute simulation games with lots to do, play Sprouts Adventure now for an exciting challenge! 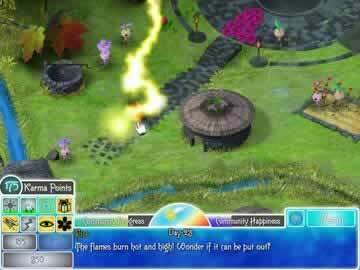 Sprouts Adventure puts you as the deity of a race of plant creatures that are near extinction after a storm wiped out their city. The sprouts need your guidance to rebuild their city and replenish their numbers. Through construction, research and various collections you can help the sprouts return to their former glory as their egg shaped deity. When a huge storm obliterates the sprouts' home and kills nearly all of them, it is up to you to help them rebuild. Only five sprouts and their egg shaped deity (which is you) remain after the storm. The village elders were all killed in the storm so the sprouts look to you for guidance. Each sprout requires four things: food, sleep, motivation and curiosity. Your ultimate goal is to make the sprouts self sufficient so that they can survive on their own. Controlling the game is very easy and only requires your mouse. To start a sprout on a task you just pick them up with the cursor and drop them where they need to be to complete the task. You also have control of karma abilities. These include things like sunshine, rain and sprout eggs. The karma abilities help you progress through the game and complete tasks. The sprouts eat flowers, so growing flowers in a garden is necessary to keep the sprouts going. To keep the sprouts working, motivation and curiosity need to be kept up. To do this there are several options: the sprouts can play games, jump on a trampoline, take a hot air balloon or even visit the zoo. Many of these options won't be available until later in the game, but collecting items will raise motivation and curiosity. Butterflies and stones are the collectible items in this game. Collecting items also earns karma points that unlock your abilities. The graphics are similar to most games in this genre and don't really stand out as anything special. Everything is 2D and you look down from an overhead viewpoint. The map is relatively small and everything is laid out for you. While the graphics aren't amazing they don't detract from the game and are well suited to the game. The sound is mostly the sprouts talking as well as sound effects for various actions. Sometimes the dialogue can be witty which adds a bit of humor to the game. Overall the sound and graphics fit into the game well and add to the theme. One minor drawback to this game is the amount of time you have to spend keeping your sprouts happy. The four stats that each sprout has will drain during activities as well as over time. The sprouts will not meet these needs themselves so you will have to direct them to eat, sleep and play. When you have 12 sprouts, taking care of them all becomes a pretty daunting task. Once you get the hang of it and get into a rotation it is not too difficult, but it will still eat up the majority of your play time. Sprouts Adventure is a great simulation game. Through careful planning and care for your sprouts you will be able to watch the city rise after the great storm. All the action while being referred to as “the great one” is a great ego boost. The few minor drawbacks pale in comparison to the rest of the game. 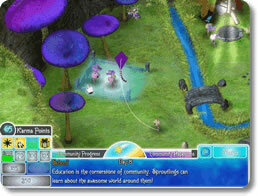 With its family friendly plant theme and easy controls, Sprouts Adventure is a game everyone can enjoy. Watch this game trailer and catch a glimpse of the island management you'll face in Sprouts Adventure.